Considering what's at stake, it's surprising how little we know about the key decisions we'll face concerning the retirement money we've accumulated. Taking charge of retirement savings today presents a whole new and complex set of decisions: Do you accept your employer's offer of a lifetime pension? Should you leave 401(k) money where it is or roll it into an IRA? What about the new Roth IRA? How can you provide for your spouse and transfer wealth to your heirs? Personal finance writer and financial education expert Margaret Malaspina takes you through all the options and decisions that you'll face when you are ready to retire and offers sound guidance customized to your own situation. This is the guide that can help you get the most out of what you've earned, lower your tax bills, and create a stream of income that will last for the rest of your life. 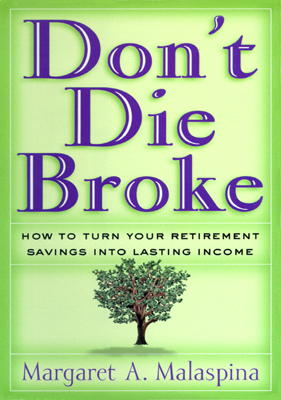 The author takes the 30,000 foot view of how to withdraw your money when you are about the begin retirement. This book contains mostly generalizations that are common sense, but does offer a few tidbits to people who are planning retirement with the next two or three years. It was written around 1999, so much of the tax info, limited as it was, may be out of date. Mostly, I felt that the meat of this acclaimed 266 page book could have been narrowed down to 20 pages.